On a lonely wharf a clerk in an ink-blue coat inspects bales and bales of paper that hold a poet's accumulated left-hand pages--the unwritten, the withheld, the unexpressed, the withdrawn, the restrained, the word-shard. 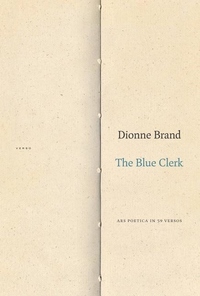 In The Blue Clerk renowned poet Dionne Brand stages a conversation and an argument between the poet and the Blue Clerk, who is the keeper of the poet's pages. In their dialogues--which take shape as a series of haunting prose poems--the poet and the clerk invoke a host of writers, philosophers, and artists, from Jacob Lawrence, Lola Kiepja, and Walter Benjamin to John Coltrane, Josephine Turalba, and Jorge Luis Borges. Through these essay poems, Brand explores memory, language, culture, and time while intimately interrogating the act and difficulty of writing, the relationship between the poet and the world, and the link between author and art. Inviting the reader to engage with the resonant meanings of the withheld, Brand offers a profound and moving philosophy of writing and a wide-ranging analysis of the present world.